Director/Writer: Jeremy Wallace / Cast: Jason Christ, Julie Farrar, Trudy Bequette, Chris Grega, Emily Haack, Robin Garrels, Todd Tevlin, Doc Brown, Joseph Palermo. Junky shot-on-video fodder with what appears to be an am-dram group choosing to go camping in the wrong town and ending up on the receiving end of a mongoloid retard’s tantrum. After the usual stop-and-search scene from an arsey deputy, who pours away all their beer, the “teenagers” begin a river canoe trip and learn from a sympathetic local that the Mayor of Old Mines has convinced the townsfolk that all outsiders are evil and therefore unleashes his son – known only as The Boy – on anyone who lingers too long. On this particular outing, The Boy has had enough of doing what Daddy says and turns on the town as well, offing some irritatingly backward extras before starting on the “teenagers”. 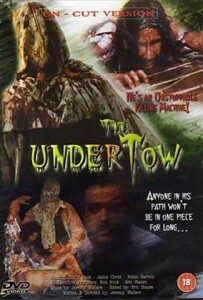 There’s gore-a-plenty in The Undertow, but it’s all a bit sloppy: one guy’s head is squeezed to the point where is brain begins leaking out in mushy chunks and another “teenager” has her innards ripped out and tossed aside like salad. But there’s a good head-on-a-spike that pleasantly echoes the Friday the 13th-wannabes of yore. tagged with accents from hell, get your own ideas!, gore o'clock, hair don'ts, slasher, what the hell! ?, who finances this crap! ?